The present study aimed to assess the occupational radiation exposure and radiation safety among medical staff in HCFs in the Eastern Province, Kingdom of Saudi Arabia (KSA). This cross-sectional study was carried out in selected HCFs in the Eastern Province, KSA in the period from February to June 2013. Preliminary information regarding the type, level, and location of HCFs were obtained from the website of the Ministry of Health and Population, the Government of Saudi Arabia. 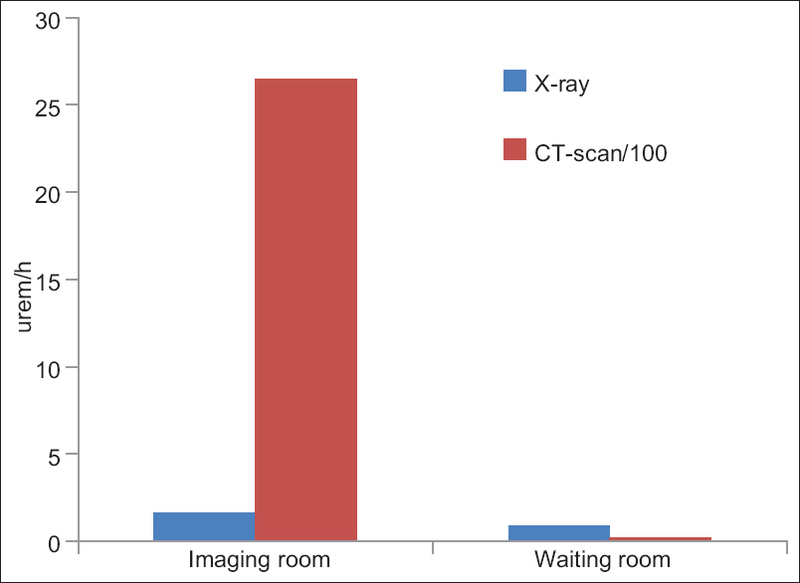 The radiation survey has been carried out by the measurement of radiation at different points of the diagnostic, imaging, and waiting rooms of different hospitals. Radiation was measured in x-ray and CT-scan rooms of four different hospitals in the Eastern Province, KSA using a portable radiation measuring instrument MicroRem (Thermo Scientific™). The measurement was performed during daytime between 8 AM and 5 PM. The background radiation was measured before the machines were switched on in respective rooms. Subsequently, after the exposure to the radiation, the fall out radiation was measured in four different corners of the radiation facility room of different hospitals. The unit of measurement was in count MicroRem per hour and converted in millisievert per year (mSv/year). Information of radiation safety was assessed by using questionnaire regarding information about basic principles of radiation safety, radiation exposure in different X-ray and CT-scan, ways to minimize radiation, formal training regarding radiation safety, and utilization of personal protective equipment. The data were entered and analyzed by using Statistical Package for the Social Sciences (SPSS) software, version 16 (SPSS-Inc., Chicago, IL). The results of our study are surprising and alarming. Though all of the medical staff were aware of the importance of radiation safety, yet significant lapses were found in practice and knowledge in this regard. A grave concern was inadequate availability of standard radiation safety equipment imaging department in HCFs. 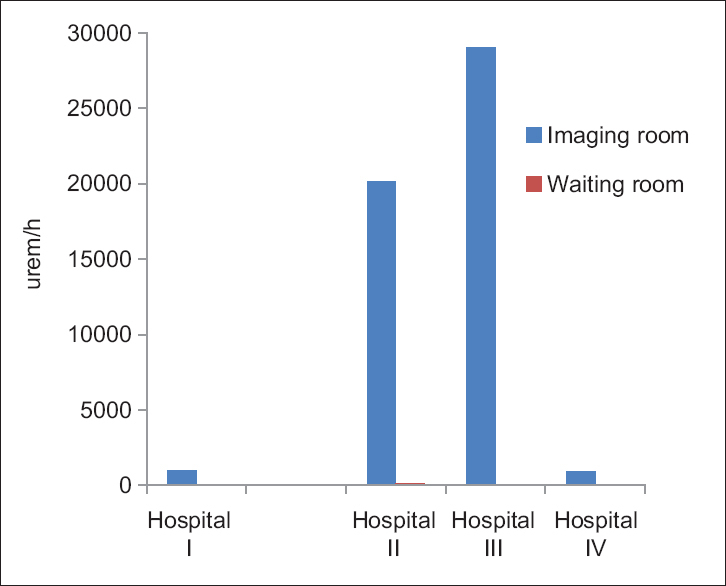 In [Table 1] and [Figure 1], there are a significant association in the levels of radiation exposure levels in all selected hospitals concerning imaging and waiting room operating X-ray image. Moreover, the high level of radiation exposure might occur due to the leakage of radiation through imaging room and the lack of radiation safety procedures during and after imaging. 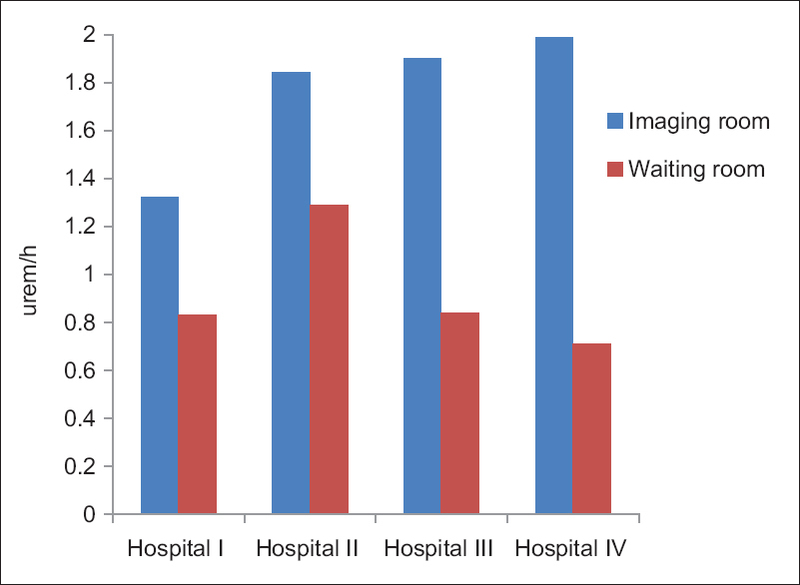 In [Table 2] and [Figure 2], there are a significant association in the levels of radiation exposure levels in all selected hospitals concerning imaging and waiting room operating CT scan. Moreover, the high level of radiation exposure might occur due to the leakage of radiation through imaging room and the lack of radiation safety procedures during and after imaging. The radiations measured at x-ray departments were beyond the prescribed level of 1 mSv/year. (for public exposure) in all the hospitals; the median values also surpassed the prescribed dose limit. The level noted among the hospitals ranged between 1.9 mSv/year and 1.3 mSv/year. Mean amounts of radiation found in different hospitals were greater than 1 mSv/yr. (for public exposure). The mean observed radiation compared with reference limit for public exposure was higher and the difference between the mean observed and recommended values was statistically significant (P < 0.01). In [Table 3] and [Figure 3], for all hospitals, the levels of radiation exposure are significantly higher that exceed the international guidelines. Similar study found that the radiation extent of scatter CT-scan facility suggests very high exceedance compared to prescribed limit of exposure. It was about 2649.34 times beyond the limit of 1 mSv/year. A comparison made to the occupational exposure limit with the observed doses, it can be stated that the observed levels were much beyond the occupational exposure limit. This suggests the high risk associated to employees and maintenance staff involved in these facilities. Therefore, immediate radiation protection measures to be started to the employees (technicians, attendants, and maintenance staff) at CT-scan. There is an obvious health risk of radiation exposure for all the exposed population visiting X-radiography department of the hospitals measured. There is however an impending risks of chronic occupational exposure to the employees, technicians, and maintenance personnel of these x-ray machines at the respective hospitals. In this scenario, there is a necessity of adequate and appropriate radiation protection at all the hospitals surveyed. Protective equipment is essential to reduce radiation exposure. During an imaging procedure, a lead apron, a thyroid shield, and lead glasses must be worn, whereas portable lead shields, lead gloves, and lead caps may be optional. Our survey found that most hospitals have lead aprons and thyroid shields in place, but only about 50% have lead glasses and lead shields, showing that many hospitals still lack essential equipment. Regarding each form of protective equipment, first, a lead apron is the most essential piece of equipment to reduce radiation exposure. Our survey showed that most health-care providers wear lead aprons (99%).Concerning facility management, leaded wall represent a total of (70%) and fire safety adequacy measures (75%). More attention needs to be paid to lead shields as well as lead glasses. Finally, radiation dosimeters do not provide protection against radiation, but tend to reduce radiation exposure because they are a crucial tool in drawing attention to radiation hazards. Survey found that the preparation and actual utilization rate of radiation dosimeters are 57.7% and 68.9%, respectively, indicating low interest in radiation exposure monitoring. All medical staff as well as patients are at risk of exposure to x-ray and CT-scan radiation exposure, and the levels are exceeding the standard guidelines. Therefore, immediate radiation protection measures needs to be initiated to the employees (technicians, attendants, and maintenance staff) at x-ray and CT-scan department. Many hospitals still lack lead shields and lead glasses, and the actual utilization rate of lead glasses, especially, is low. Future efforts should include minimizing radiation exposure during imaging procedures, and more interest in wearing and preparing protective equipment is needed. Also, hospitals should provide continuous education and supervision for the radiation protection. Covens P, Berus D, Buls N, Clerinx P, Vanhavere F. Personal dose monitoring in hospitals: Global assessment, critical applications and future needs. Radiat Prot Dosimetry 2007;124:250-9. Mettler FA Jr, Kelsey CA, Ricks RC. Medical Management of Radiation Accidents. Boca Raton, FL: CRC Press; 1990. p. 1-16. No. RS-G-1.5 Safety Guide: Radiological protection for Medical Exposure to Ionizing Radiation. Vienna: IAEA; 2002. p. 76. Greenlee C, Burmeister LA, Butler RS, Edinboro CH, Morrison SM, Milas M . Current safety practices relating to I- 131 administered for diseases of the thyroid: A survey of physicians and allied practioners. Thyroid 2011; 21:51-160. Kronenberg A. Radiation-induced genomic instability. Int J Radiat Biol 1994;66:603-9. Charles M. Source and effects of ionizing radiation. J Radiol Prot 2001;21:83-6. Goske MJ, Applegate KE, Boylan J, Butler PF, Callahan MJ, Coley BD, et al. The ′Image Gently′ campaign: Increasing CT radiation dose awareness through a national education and awareness program. Pediatr Radiol 2008;38:265-9. Donnelly LF. Lessons from history. Pediatr Radiol 2002;32:287-92. Goans RE, Waselenko JK. Medical management of radiological casualties. Health Phys 2005;89:505-12. McCusker MW, de Blacam C, Keogan M, McDermott R, Beddy P. Survey of medical students and junior house doctors on the effects of medical radiation: Is medical education deficient? Ir J Med Sci 2009;178:479-83. Son BK, Lee KT, Kim JS, Lee SO. Lack of radiation protection for endoscopists performing endoscopic retrograde cholangiopancreatography. Korean J Gastroenterol 2011;58:93-9. Piwowarska-Bilska H, Birkenfeld B, Listewnik M, Zorga P. Long-term monitoring of radiation exposure of employees in the Department of Nuclear Medicine (Szczecin, Poland) in the years 1991-2007. Radiat Prot Dosimetry 2010;140:304-7. Valuckas KP, Atkocius V, Samerdokiene V. Occupational exposure of medical radiation workers in Lithuania, 1991-2003. Acta Med Lituanica 2007;14:155-9. Jabeen A, Munir M, Khalil A, Masood M, Akhter P. Occupational exposure from external radiation used in medical practices in Pakistan by film badge dosimetry. Radiat Prot Dosimetry 2010;140:396-401.